Definitely worth a visit for anyone interested in religious architecture is the 12th century Abbaye aux Dames church, once part of a monastic collective for women founded 100 years or so earlier. 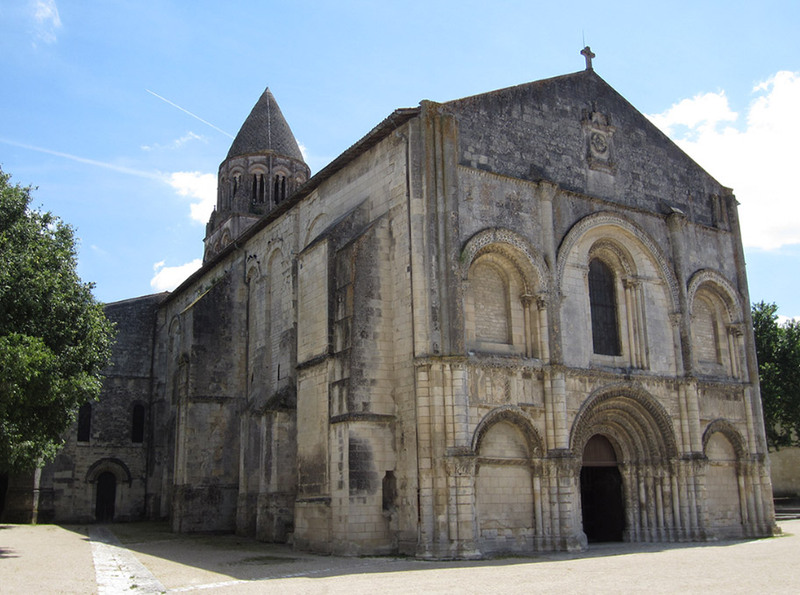 The Abbey of Sainte-Marie-des-Dames was the first Benedictine abbey in the Saintes area and was founded in 1047 by Geoffrey II, Count of Anjou and his wife Agnes. 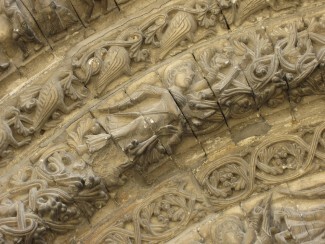 The Abbey enjoyed considerable influence until the 18th century. During the French Revolution it was turned first into a prison and then by royal decree into a barracks. The building stands back from the street on rue St-Pallais in a sandy courtyard behind the slightly smaller Romanesque church of St-Pallais and is as delightfully quirky as Notre-Dame la Grande in Poitiers. The most remarkable features of the church are the facade and the belltower. The facade has an elaborately carved doorway displaying angels adoring the Hand of God, the suffering of the martyrs, old men wearing crowns playing music as they face each other and other scenes. On the right arcade the coving displays the Last Supper. Visitors can access the bell tower which is built in the shape of a pine cone and is covered with stone chippings. From the top of the tower, there is a fine view over the city of Saintes. It’s also possible to visit the convent buildings. Click photos to enlarge. Today, the Abbaye aux Dames is a venue dedicated to music featuring events and festivals such as the Saintes Music Festival and the “Jeune Orchestre de l’Abbaye aux Dames”, season of concerts. In fact it was the Music Festival , started in 1972, which gave the impetus for the restoration of the building. Here history and music co-exist harmoniously. There are music training courses on offer and accommodation is also available if required. 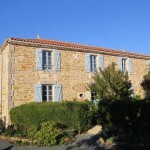 The Abbaye aux Dames is a haven of peace and quiet in the heart of the city. • January, February, March, November: from 2pm-6pm.